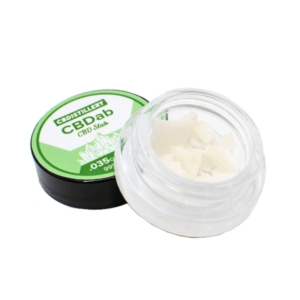 CBDISTILLERY’s wide selection of 99+% pure CBD isolates are made from Non-GMO pesticide free, CO2 extracted industrial Hemp oil. They have Powder, Slab and flavored Terpsolates available. Flavors such as: Serendipity, Jack Herer, Bubba Kush, Tangie, Blue Dream, Cherry Pie, Berry Blossom, The Yummy and Cherry. These isolates are wonderful if you like to mix your own flavors or experiment with different dosing methods. Either way this is one of the most concentrated forms of CBD to work with. quantities of 1/2 gram up to 14 grams per container.